Ad Aged: A month of 0-fers. On Saturday, long before Tiger Woods gained a victory at that horribly, white-supremacist-named golf tournament, The Masters, a bigger event happened in the ever-expanding world of sports. Chris Davis, the worst hitter in Major League Baseball history (last season he batted a paltry .168—62-pounds below his playing weight) finally got a base-hit. Davis was hitting an even-more paltry .000 at the time, having gone 54 straight at-bats, going back to last season, without hitting a ball safely. 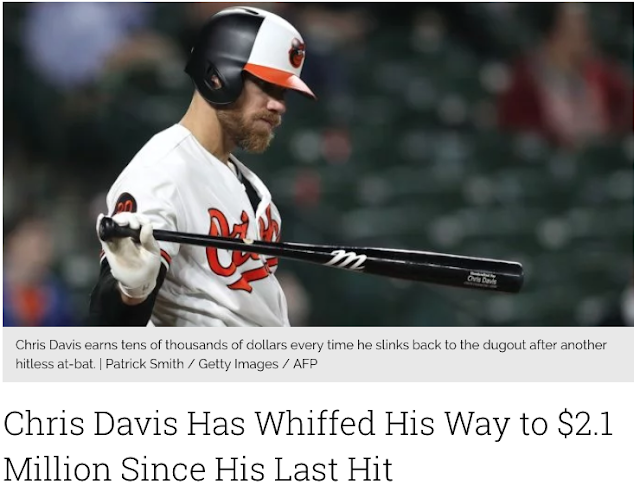 Though Davis has had some excellent seasons in the bigs, he slammed 53 home-runs in 2013, and 47 in 2015, for the last five years, he’s hardly earned his $17 million salary. Not counting this young season, over the last four years he’s batted .262, .221, .215 and .168. Along the way, Davis has led twice the league in strike-outs with 208 and 219, and finished two more seasons with 195 and 192. If you’re keeping score, that’s 90 more strike-outs in four seasons, than Ted Williams, the Splendid Splinter, had amassed in 19, and more than twice as many as DiMaggio had in 13. It all brought me back to my one long season in the Mexican Baseball League, which probably took place before you were born, way back in 1975. After about a month in the Mexican Baseball League, manning the esquina caliente--the hot corner, for the Seraperos de Saltillo, I hit a rough patch. A very rough patch. I had been hitting in the high-.300s, with decent power and it looked, however feebly, that I might perhaps have more of a career in baseball than I had imagined. Even more than I imagined after I had eight or a dozen beers in me. Hector Quesadilla--the Seraperos' legendary manager had great faith in me. That boosted my confidence. Accordingly, I was seeing the ball as big as a grapefruit, just chugging to the plate, waiting to be smacked. Then it happened. As it happens, at times, to all of us. That which we have done all our lives, done with ease, done without even, perhaps, thinking, we can no longer do. We lose, sometimes suddenly and almost always inexplicably, our abilities. Or as the great Roman poet Horace put it two-millennia ago, “non sum qualis eram.” I am not now what I once was. “No,” he answered, “Le diste en su manera de salir de ella.” You hit your way out of it, he said. “Non sum qualis eram,” I said to myself. I am not now what I once was. Harsh, when you’re sixty or seventy. Horrifying when you’re 17. My batting average was falling like a runaway elevator. And all the while, Quesadilla kept me in the line-up, saying, as he said, “Le diste en su manera de salir de ella.” Hit your way out of it. Nearing the end of three weeks my batting average was approaching what baseball people call “the Mendoza Line,” that is, a mark of batting futility named for a journeyman infielder from the 1970s called Mario Mendoza--who hit below .200. Worse, I was afraid they'd come up with new jargon: The Navidad Nexus--when a player fails to hit his playing weight. I weighed in at 190 in those slimmer days, and my batting average was looking to match that sad number. The hits kept not coming. And Quesadilla kept saying "Le diste en su manera de salir de ella." But I wasn't hitting my way out of it. I was stinking up the place. I went 19 games without a hit. 71 at-bats. I had started my slump batting .355 and as I approached my 20th game, I was batting a plebeian .219. I grabbed a bat and walked to the plate. I forgot about all the adjustments I had gone through in the previous 19 games. I just went up to bat. “Put good wood on the ball,” I repeated to myself. From there on, things returned relatively to normal. I started hitting again, my average began to reverse its descent as did my confidence. I had hit my way out of it, as we usually do when we’re mired in a slump. When we can’t put wood on the ball. Can't do the job we want to do. Even today, when I’m stuck on something, I look over to an imaginary bench. I see Hector there, calm and Buddha-like. Hit your way out of it.